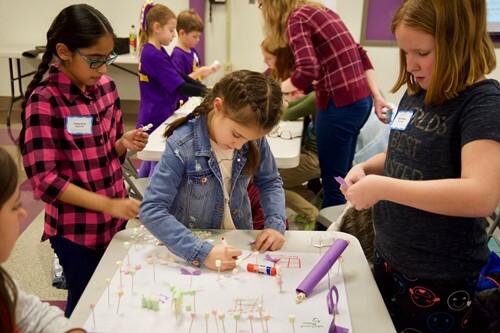 On November 30, approximately 30 third and fourth-grade students from Albion, Royal View and Valley Vista Elementary came together with District administrators and architects from ThenDesign Architecture to help design the new playground that will be built at the new North Royalton Elementary School. The meeting began by the students reviewing the site plan and playground locations and the architects asking the students what their favorite activities are on a playground. The students then broke up into pairs to select their favorite pieces of equipment out of five categories: swings, slides, overhead, motion/balance and bridges. The pairs of students then collaborated and brainstormed with their peers to narrow down their favorite pieces from each category. During the last part of the meeting, students were actually able to design a playground from a variety of materials such as markers, paper, dots, and toothpicks. The students enjoyed being creative and presenting their creations to not only their friends, but the architects as well.